As part of my New Years Promises this year I promised that I’d read at least a book a week for the entire year. To help me keep that promise I’ll post a quick review of each book here on this SalesFu Blog. I’m don’t have one of those fancy Amazon affiliate accounts, but I should probably look into that and see if i can link it up. 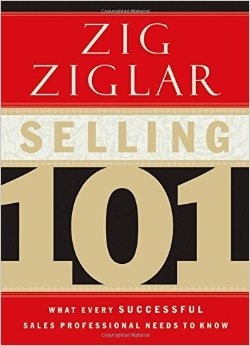 The first book we are going to talk about this year is short and sweet- Zig Ziglar’s Selling 101. To be honest I had no idea what I was buying. I didn’t realize that this was more of a Pocket Version than a full fledged book on it’s own, but I don’t think that’s a bad thing. You should be aware that this book is indeed small, it fits into my inside jacket pocket and into my Levi’s back pocket. That being said, it’s like the Mighty Mouse of sales books, it packs a decent sized punch and can save the day if you give it a chance, plus it’s kind of nostalgic. I’m in my 40’s and I’ve been reading Ziglar’s stuff for my entire adult life and it still rings true. This book will do 1 of 2 things for you, it will either remind you of all the basics that you already knew or it will open your eyes to how much more there is to this business than just offering a product. I’m OK with either outcome actually. The principals that Zig outlines in this book are just the tip of the ice berg, it’s like the CliffsNotes version of all of his other works. The title says it all actually, this is indeed Selling 101, a basic foundation to build upon. There are many people in the Sales Industry that got there by accident. These are the people that just lucked out, maybe weren’t the best students and maybe haven’t read a book in years. This is a good little book because it’s not intimidating, you can get through it in a couple of lunch hours and pull some useful info out of it. The best part is that even though Zig passed away a few years ago, he is still selling. This book is designed to Motivate you to better yourself, and with that desire you’ll want to go further on the journey with Zig. Luckily his legacy is carried on by his family and you can buy all of his other books, his certifications and classes online. This book makes me want to buy more from him, and it’s a win-win. In the mean time I’m going to listen more, sell with integrity and proceed with a couple of simple plans.